Marathons and Half Marathons are often much more about the people running than the event itself. 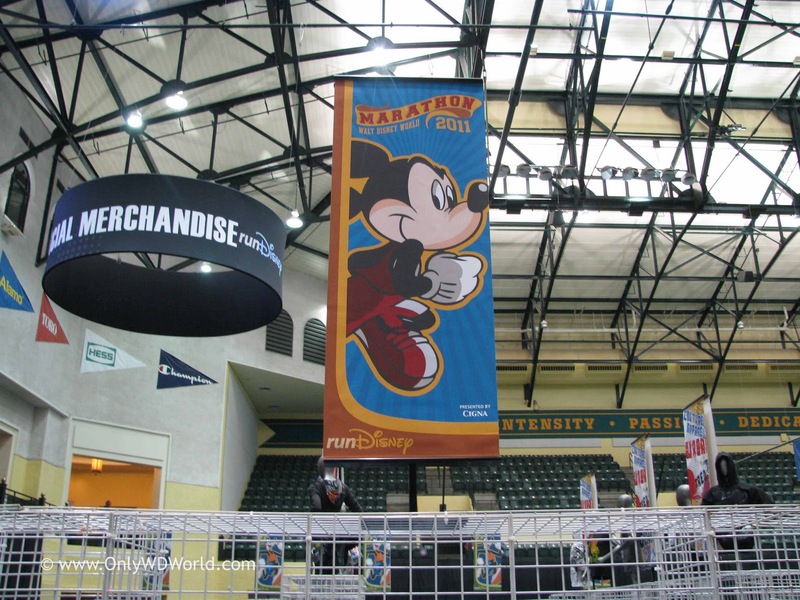 The Disney World Marathon Weekend is no different. 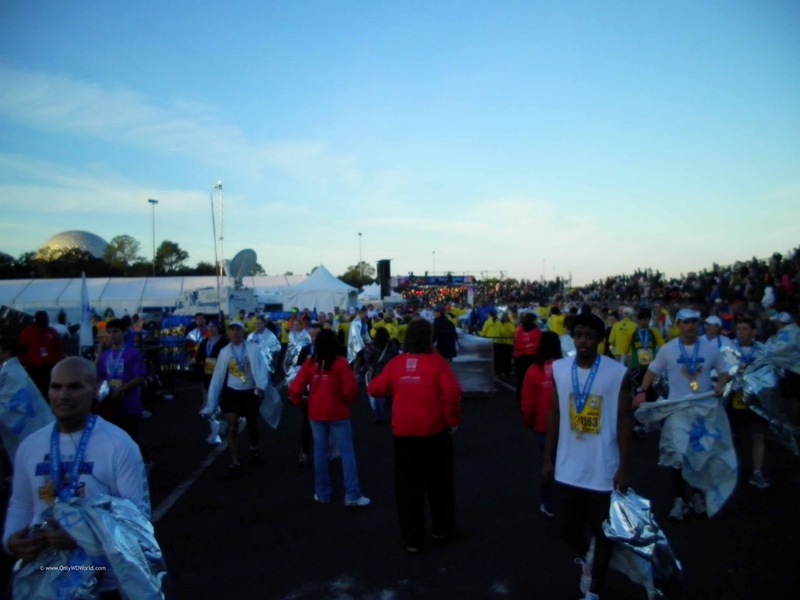 Thousands of people of all shapes and sizes make their way to Florida to run, jog, and walk their way to the finish line. Each one has their story of their journey leading up to this race. 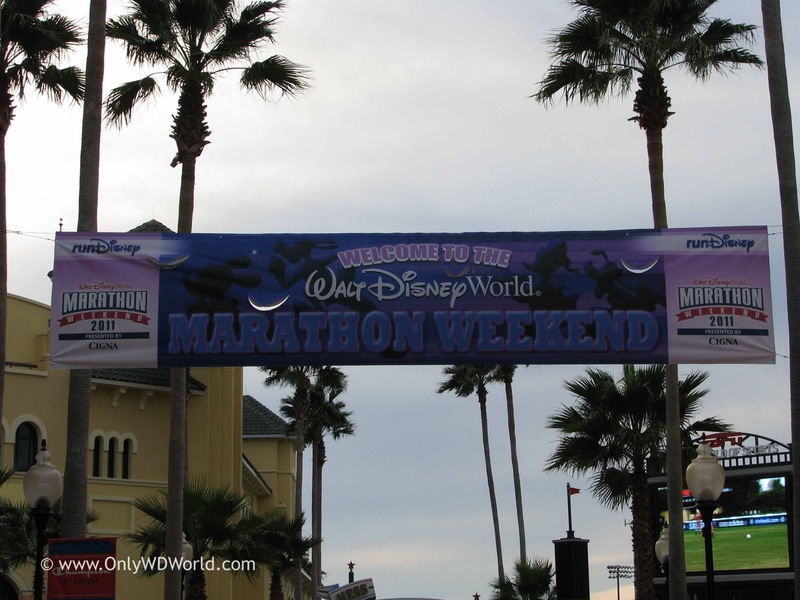 I am reposting my personal story from my first experience with the Walt Disney World Marathon Weekend in 2011 when I ran the Disney World Half Marathon. 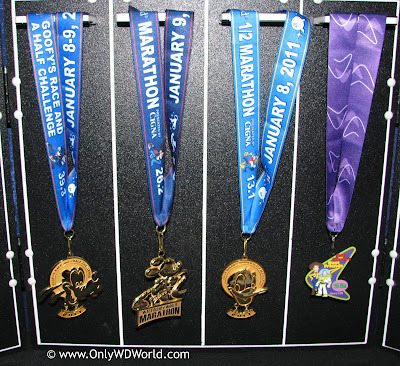 After a great experience I went on to successfully run and complete the Disney World Marathon in 2013. This is my story, feel free to share yours in the comments! The Disney World Marathon Weekend for 2011 is now complete and I have returned home after experiencing my first taste of this Disney World Running Spectacular. Each year thousands of runners make the pilgrimage to Orlando, Florida in order to participate in one of the running events for the weekend. There are several different distances available in order to appeal to all types of runners. Ranging from the 5K held on Friday, to the 13.1 mile Half Marathon on Saturday, and the full 26.2 mile Marathon on Sunday. They even have special names for the people courageous enough to run more than one of these in the same weekend. 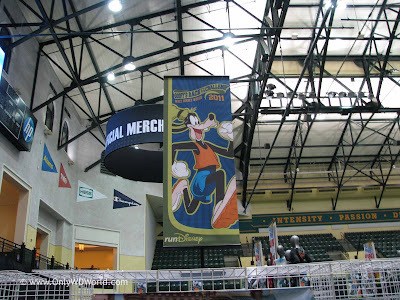 If you run the Half Marathon and the full Marathon on back to back days it is called the Goofy Challenge which is a title officially recognized by Disney. Unofficially there is also a Dopey Challenge for those who run all 3 races during the weekend. 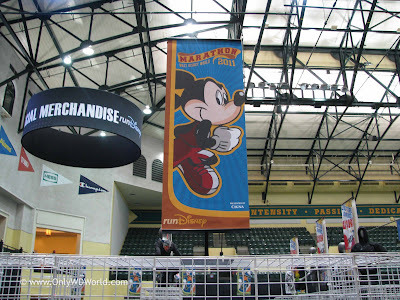 My Half Marathon started by driving 626 miles from North Carolina to Walt Disney World and going directly to theESPN Wide World Of Sports Complex to pick up my race packet that includes my Race Bib and final instructions for the race. It was here that I started to recognize the magnitude of the event. 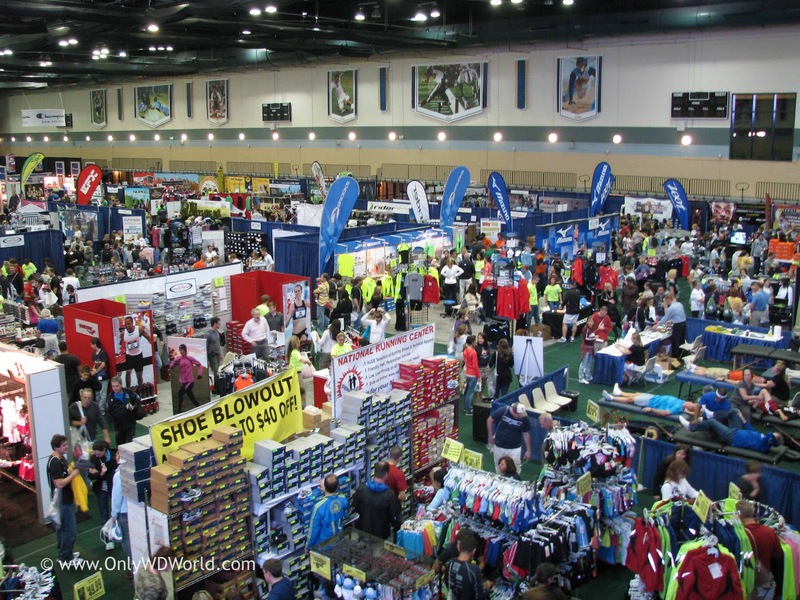 The facilities are huge and 2 different sports venues were required to contain the registration and the Expo area for the weekend. The picture below shows a glimpse of the main floor of the Expo and all that was going on. 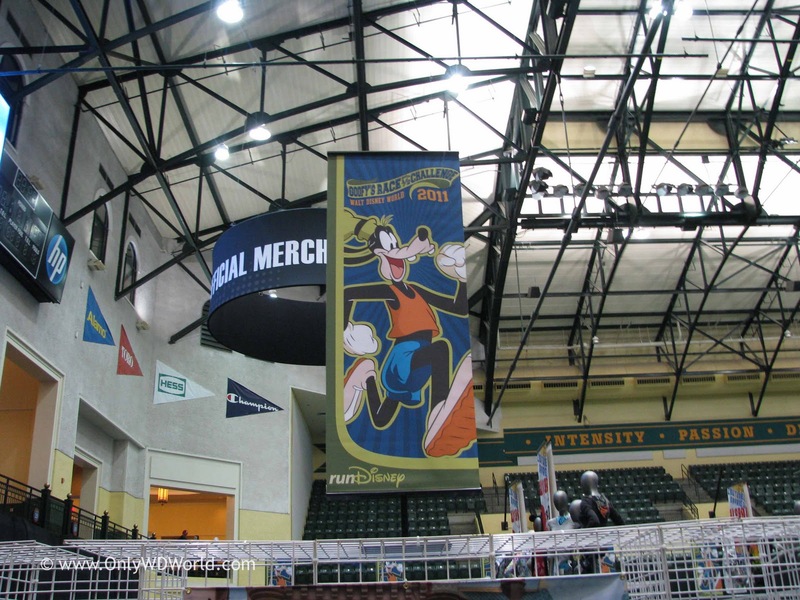 I was also able to see my reward (pictured below) when I made it to the finish line on Saturday, the Donald Duck Half Marathon Medal. 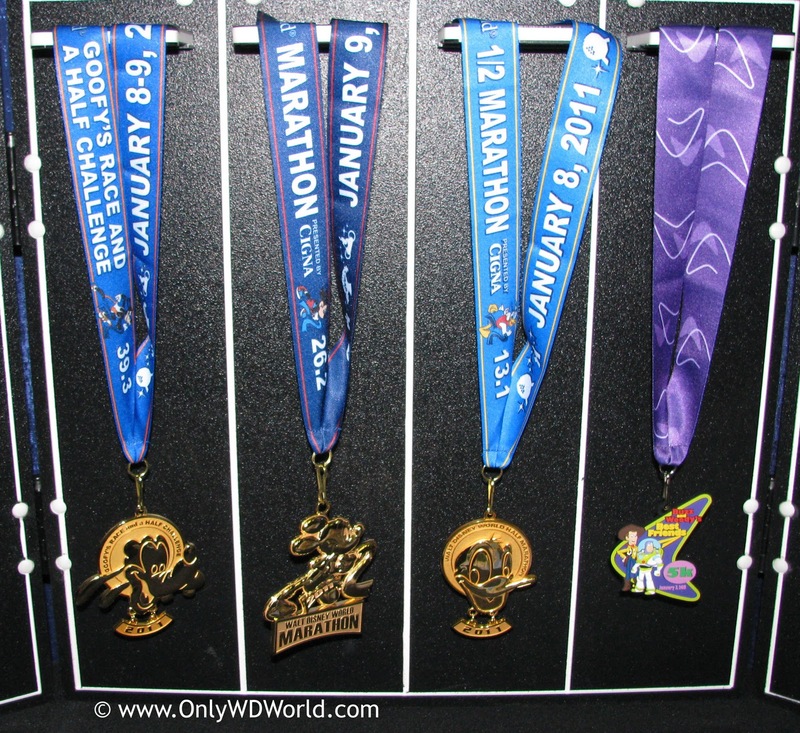 I could also see the other medals being awarded to the finishers of the other events. 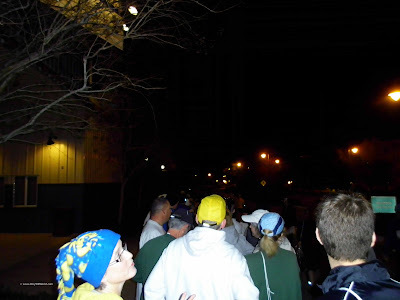 It was here that I learned that 28,000 runners were signed up to run the Half Marathon with me. After running several local events that ranged from a couple hundred to 2,000 the thought of 28,000 runners was staggering. Saturday was race day and for me it started with the alarm going off at 3:00 AM. It was time to get up and prepare to run in the race that I had run of 550 miles during 2010 to prepare for. I was staying at the Saratoga Springs Resort at Disney World, so after getting ready I headed out to the location for the the shuttle bus to the start of the Race in the Epcot parking lot. I arrived at the bus stop at 3:50 am to discover that there were already about 400 people in line ahead of me waiting for a shuttle bus. I continued to wait, not seeing any buses until 4:20 AM. I watched 5 buses come and go before it was my turn to board. 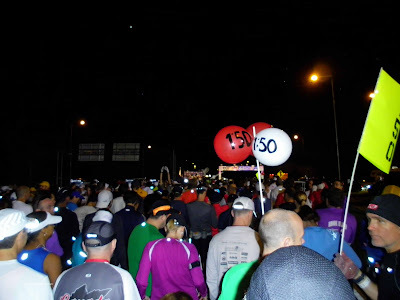 Those of us in line were getting nervous as it was already nearing 5:00 am and the race was to start at 5:35 am. We arrived at the Epcot Parking lot at 5:20 am and I started running to my starting corral which was about 1 1/2 miles away. I was not about to miss the start of the race after all of this time looking forward to this moment. As the singing of the National Anthem began I was nearing my place in Corral A.
I arrived just prior to the start of the Wheelchair participants and just about 3 minutes later the race started for those of us in Corral A. I wasn't there long enough to fully enjoy the surroundings and notice Mickey Mouse at the start to kick off the race. Once the fireworks lit up the early morning sky, the time that had been circled on my calendar for the whole year had arrived. The race was beginning! There were people of all shapes and sizes surrounding me. Some were veteran runners looking for a personal best time, others were here to discover a new way to experience Disney World. Many ran on behalf of charities or to honor loved ones. Many overcome great challenges to be there to participate. There were participants representing all 50 states and many different countries. They travelled distances that made my 1,252 mile round trip drive pale in comparison. My story is one of a man that made a New Year's Resolution in 2010 that he kept. 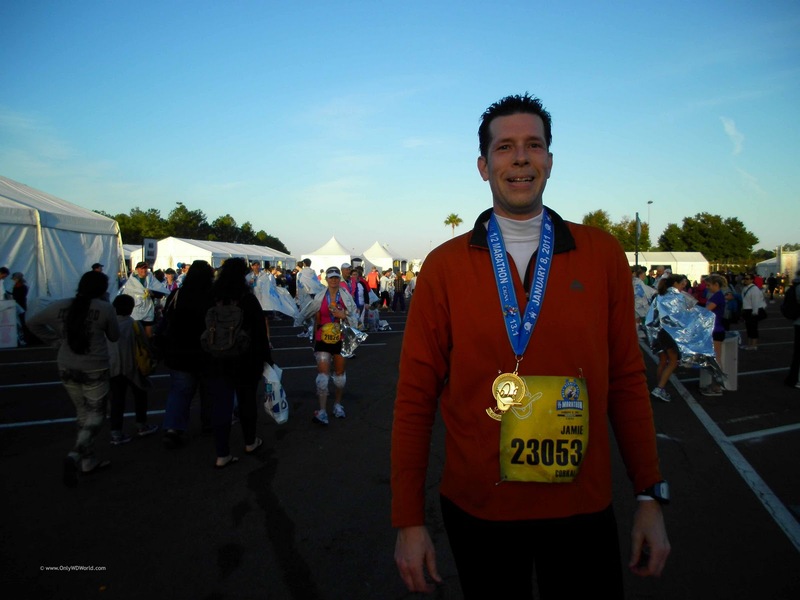 After running the Race For The Taste 10K in 2009 at Disney World with minimal training, I was hooked and decided to make the commitment to start running on a regular basis to improve my fitness and to be able to compete in the Disney World Half Marathon in 2011. I even made the foolish statement that I would run 500 miles during 2010. I had never run even 50 miles in a year prior to that. 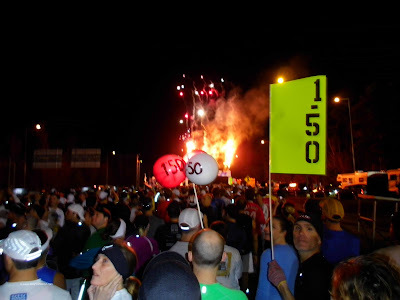 I finished 2010 logging over 550 miles even though a knee injury forced me to cut back my running significantly in December. That didn't help my endurance during the race and neither did the pre-race sprint to the starting line, but this was a race to be enjoyed and savored. It is hard to adequately describe the joy of seeing all of the people cheering on the runners at various stages of the race. Most of these people maybe only knew a couple of people running, but they valiantly cheered for all that passed by encouraging them to keep going. There were High School Bands and Cheerleaders, as well as Disney Characters along the course cheering on the runners and providing entertainment. The Disney Cast members and the race volunteers were wonderful. I cannot thank them enough. Their efforts were very much appreciated by myself and the others who ran. Your words of encouragement and support meant a lot during the race. Those who made the special effort to read the runner's name on their bib and personalize their support made it even better. We may have been too focused or tired to properly express our gratitude during the race, but I want to say: THANK YOU! Running through the Magic Kingdom and Epcot is also an added perk of running this race at Disney World. I may have not set the world on fire, but I finished in the top 10% with a time of 1:55:45. Not quite as fast as I hoped, but considering all that transpired, a time that I am happy with. The above picture was taken shortly after finishing the race with a look back towards the Finish line in the Epcot parking lot. You can see Spaceship Earth in the background and the Finisher Medals around the necks of the exhausted runners. I was able to talk one of the volunteers to snap this picture of me with my Donald Duck Medal just after finishing the race. When the Disney Imagineers create an attraction their focus is on the story. It is the story that guides their focus and their design. 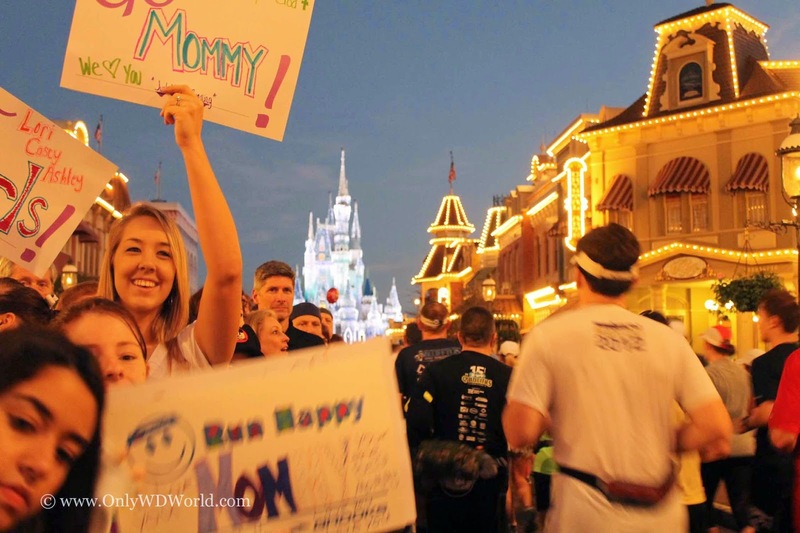 The Disney World Marathon Weekend, the jewel of the RunDisney series, creates individual stories for each of the participants. There are stories of success and failure, and there are great stories about the journeys that many of the participants took to get there and the journeys they took to complete their races. Not everything is perfect (the shuttle buses running late for example), but the stories and the memories that you take away from an event like this are why so many people come back year after year to compete again. They do it to take their own personal journeys and share in the experiences of others. If you have ever thought about running an endurance race, this annual event is certainly one that should be considered. Thank you for listening to my story, which is just one of 28,000 from the Disney World Half Marathon. 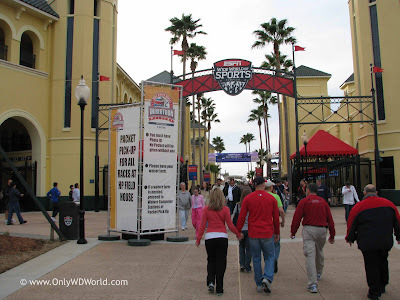 0 comments to "My Disney World Marathon Weekend Story"